[SOLVED] Why doesn&#39;t first execution plan use RowCount Spool? [SOLVED] Why doesn't first execution plan use RowCount Spool? Here is my repro that was tested on SQL Server 2008 R2, 2012, 2016. The second and the third queries do use RowCount Spool, why the first does not? Table 't'. Scan count 2, ***logical reads 20024***, physical reads 0, read-ahead reads 0, lob logical reads 0, lob physical reads 0, lob read-ahead reads 0. Table 't'. Scan count 2, logical reads 48, physical reads 0, read-ahead reads 0, lob logical reads 0, lob physical reads 0, lob read-ahead reads 0. Table 't'. Scan count 2, logical reads 27, physical reads 0, read-ahead reads 0, lob logical reads 0, lob physical reads 0, lob read-ahead reads 0. This is just a cost based decision. There are roughly 2,000 rows in the table for all v values from 0 to 4 inclusive and no other values of v.
The semi join can stop requesting rows after the first one is returned so SQL Server assumes it will only need to read 5 rows before it finds the first one matching v=4. When you add having count(*) > 0 it now needs to read the whole table to get the COUNT(*) and can't stop after the first matching row is found. 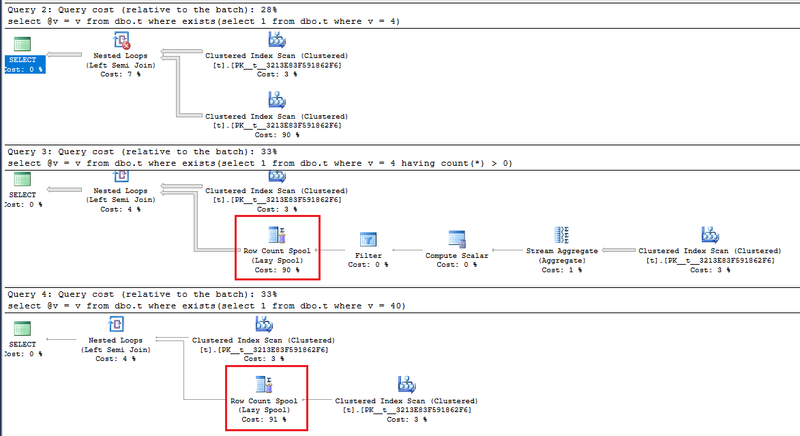 With v=40 this doesn't exist in the data at all but SQL server again needs to read the whole table to be sure of this. The cost of reading the whole table for every outer row vs just reading a few rows from it is sufficient to make the plan with the row count spool optimisation attractive. You can try the following with v=4 and v=40 and diff the results in a text diff tool. The results of the final memo are very comparable in terms of options explored but a different final result was chosen on cost grounds. The plan with the spool chose PhyOp_LoopsJoinx_jtLeftSemi 6.2 13.1 and without it was PhyOp_LoopsJoinx_jtLeftSemi 6.2 8.2. 6.2 is the clustered index scan that is the same on both plans. 8.2 is the scan with filter executed 10,000 times. 13.1 is the spool built from executing the scan with filter once. The hint OPTION (NO_PERFORMANCE_SPOOL) removes the row count spool from the v=40 plan for comparison purposes. I was expecting that USE HINT ('DISABLE_OPTIMIZER_ROWGOAL') would do the opposite for the v=4 plan but despite group 8.2 now being costed in the memo at 158.804 it still gets selected and the overall plan is costed at only 0.939204 as the anti semi join costing itself still scales down the costs to reflect that it will only require one row from that input. Moreover with this hint in place there is no PhyOp_Spool option available in the final memo anyway. Paul White points out in the comments that the performance spool can be achieved with the use of OPTION (QUERYTRACEON 8691). [SOLVED] Check existence with EXISTS outperform COUNT! ... Not?